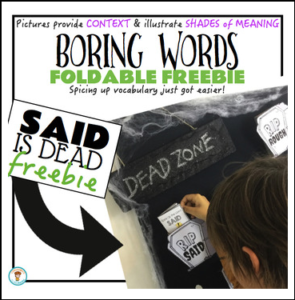 Need an engaging way to get your students to replace the overused word ‘said’ (often referred to as a tired/boring/dead word). ♦ The synonyms within the book are grouped together based on meaning; and the words are illustrated to show this. ♦ The splash of color in each image helps students zero in on the part of the picture that highlights context. ♦ The illustrations not only serve to show students the meaning of a word, they serve to entertain and engage learners as well. I created my picture thesauruses as a way to solve a problem I was having in my classroom. I wanted my students to be more descriptive in their writing, but the traditional resource used for finding better words – a thesaurus – was just not working! Students would arbitrarily select a word from the long list provided, and often, the word selected was used incorrectly (ie. not in the right context). I began to wonder… how could I show my class that each word in a thesaurus has a slightly different meaning? If only there were visuals to help students SEE the subtle differences between synonyms, I thought. So I began working on solving these problems… and presto, my mini “picture thesauruses” (yep, that’s a term I made up) were born. Kid friendly! Fun! Interactive! Engaging! Easy to use!!! My bundle of mini books (in the complete set) is based on THE 5 SENSES + EMOTIONS because I find that when students describe the look, smell, taste, sound or feel of an object, it just catapults their writing to a whole new level. Using precise vocabulary to describe emotions helps students add some ‘voice’ to their writing!If you want your students to expand their vocabulary, you can download the complete set HERE.